Have you never registered online for a race before? Are you unsure of where to start, or how to finish? Is the thought of securing a transaction for a race online worrisome? Are you someone who may prefer the old-school way of registering with pen, paper, check, and mail? If you fall under any of these categories, no sweat! We got you covered and we’ll show you the best ways to search for races and to leverage the online community as a resource rather than a perceived obstacle! First off, let’s say right away that you can still often register with pen, paper (racing form), check (or credit card) and standard mail. How? If you are a runner who joined a running club, ask the president of the running club! If you are not a participant or member of your local running club, then become one! How? There are many ways. 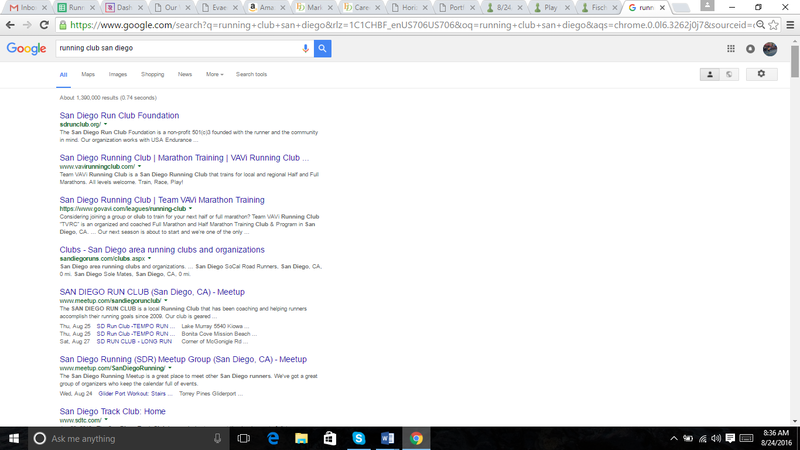 You can google your city and then type “running club” such as San Diego Running Club. Watch the results! Always scroll down to see all results and if you haven’t found what you are looking for, go to page 2 in Google! For me, San Diego Track Club wasn’t the first result that came up in Google for this search. But it was the running club I knew I wanted to join based on location, number of participants, and workout types and times the workouts took place during the week. Also, they indicated programs to join which appealed to me via their website. Typically, there are always announcements made before or after runs at the running club. Often there are also tables which feature upcoming races for the calendar year. Interested in runners’ personal insights on how joining a running club made them better? Check this article out! Now, perhaps you are a runner who wants to learn how to find races online. No sweat. Let’s starting about that now! Then when you find the race you want, all you have to do is click on the link and it should take you right to the race website where you can find everything you need from how much the race costs, where it is, distance options (5k, 10k, half, etc) exact time for start, what you get from running (shirt, medal, prize for finishing in top 3), course map, contact email or phone number for race manager, what happens after the race, and if money goes to any specific fundraising group. Of course, you can find a lot more information about the race but this is just the basic details. And, legitimate running sites for races are the most secure places to do online transactions. In all of my years of competitive running, never have I had an issue with registering for any race online or getting an official receipt via email showing how I paid and that the transaction went through accordingly! Now maybe runningintheusa isn’t the site for you. Maybe you want to go back to that original Google search result and use another site. Go for it! Other prominent race listing websites include and are not limited to: active.com, raceplace.com, runningcalendar.com, roadracerunner.com. You’ll also start seeing the individual race sites themselves coming up. You could also go this route. Just be sure that the date is correct and the result isn’t coming up for a prior year’s race. Believe it or not this happens because of how popular the race was and how many participants ran in the race. 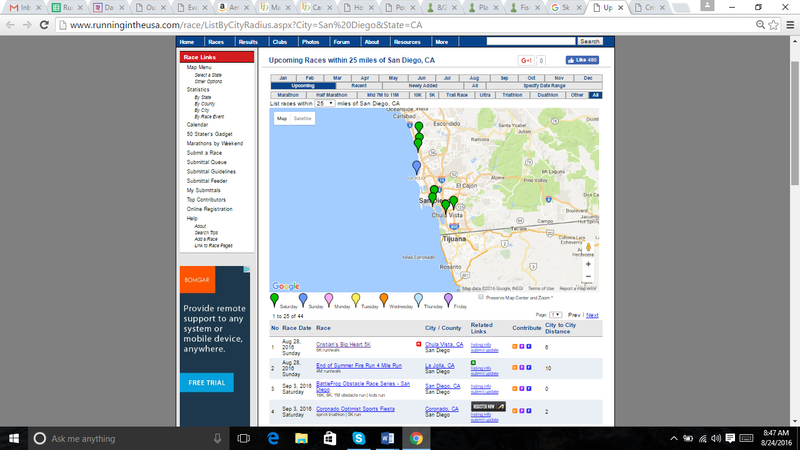 For instance, SD Half Marathon could come up after it was just finished just because of how strong the website was! Now, Google search isn’t always the only option to find local races! 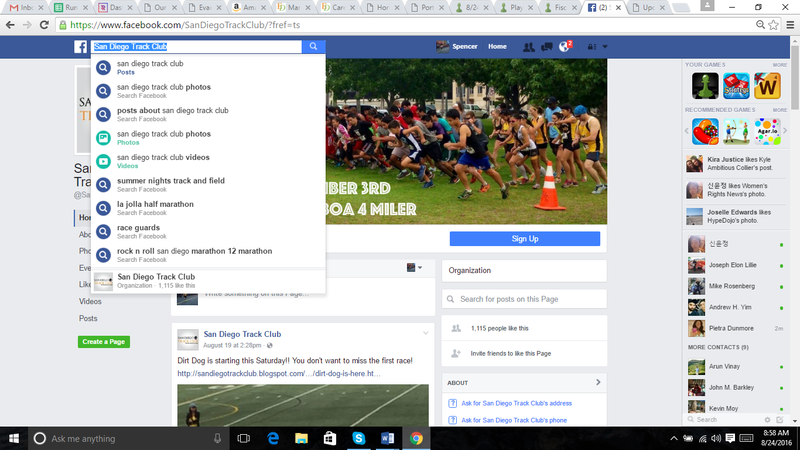 If you are a Facebook user or want to become one, head to the running club you are active in by searching for it in the Facebook search bar. 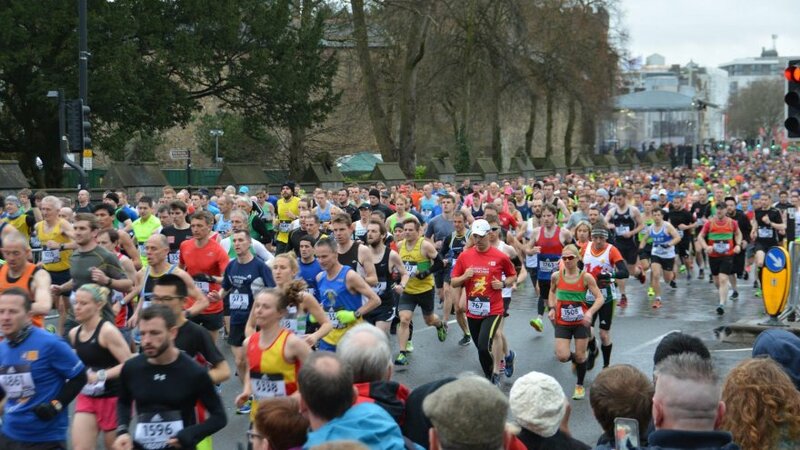 There’ll you see its page come up and it is there often you’ll see all the local and in particular running club affiliated races listed on the page. These Facebook pages also serve as a real-time forum to connect with club members and ask any questions you have about the race! Sometimes email can be great, sometimes Facebook messaging and post can be even greater! Check out this article “Tricks for Making Your Running more fun and social!” Any questions about how to find a race online still? Post your questions below and we will get back to you as soon as possible! Are you someone who has additional insights into helping runners find races online? By all means, post your searching techniques below! Help a fellow runner out!